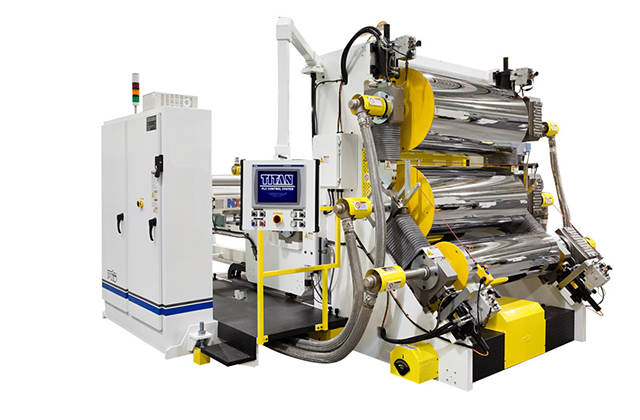 Model 6000 complex Co-Extrusion Sheet System featuring a REVOLUTION® Model J7018303030 Sheet Take-off System with a telescoping conveyor. PTi offers complex co-extrusion sheet systems for producing PS, PP and PS/PE structures based on symmetric and asymmetric barrier sheet materials. For direct extrusion applications, both single and multi-component blends of EVOH resins are used as the barrier performance layer(s). 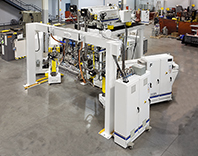 Unique five roll sheet take-off arrangement features a telescoping carriage that permits rearward side operator access for cleaning rolls even during production runs. Seven Layer Co-Extrusion System showing triple manifold die with unique gantry support and two extruders mounted on mezzanine for space saving.